Throughout the recent evolution of time and attendance technology, those famous words spoken by Seneca 'Time discovers truth' may be becoming truer to the point where this ancient Roman philosopher may have rephrased his words to say 'Time and attendance systems discover truth'. The purpose of a time and attendance system is to record employee attendance at a particular place or activity, which is essential when paying workers at an hourly rate. Traditionally a time and attendance systems allowed the employee to clock in or out of work by punching or stamping a card inserted into a machine. This recorded the relevant time in/out information as they arrived and left work. With major developments in technology, these systems have evolved into individual swipe card systems which are often linked to time management software, payroll accounts and other administrative systems. Time and Attendance ( or Employee Attendance Software) takes the concept of 'clocking in' even further allowing employers to electronically track their employees. This can involve detailed reporting on employee attendance and monitoring shifts and departments with total accuracy. You may have found employees manipulating their working hours by creating their own timesheets in advance or having other employees clock in or out on their behalf. An effective time and attendance system will prevent these problems by isolating and managing individual employee status. By fully integrating your new time and attendance system into a database, you can reduce human errors and have confidence in easily accessible accurate employee information. Time and attendance software helps you meet your company's payroll criteria whilst contributing to satisfy the demands of local payroll regulations, thus ensuring your workers are fairly paid. With the detailed reports time and attendance software can produce in just seconds, employee disputes over pay are vastly reduced. Time and attendance software provides a valuable service for both your company and it's employees by providing information over a range of areas appropriate to business administration. The time and attendance system ensures that employee hours are accurately calculated and employees are paid fairly which serves to protect both the employer and employees interests. In this regard you'll have no trouble gaining the support of your employees when implementing the new time and attendance technology. 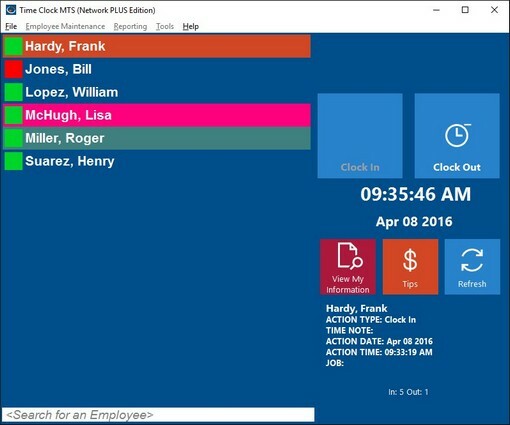 Whether you're a small business or a large conglomerate the many applications of time and attendance software will make it a valuable addition to your administrative system. By providing accurate reports and records, saving your administrative staff time consuming tedious work prone to errors you'll be serving the best interests of yourself and your employees in contributing to a successful business.